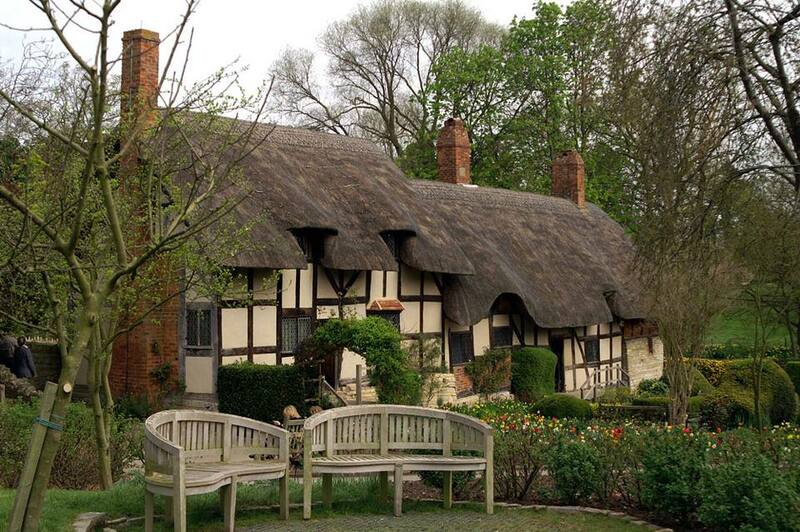 Famous for it's chocolate box-pretty thatched roof and quintessential English country garden, Anne Hathaway's cottage also sheds light on Shakespeare's early marriage to a much older woman. And, contrary to rumors, it looks like it was a love match. If you have imagined punctuating your tour of England with a visit to a pretty, half-timbered, white-washed and thatch-roofed cottage, you've probably seen pictures of Anne Hathaway's cottage. It is, after all, one of the most famous thatched cottages in the world, featured on calendars, book covers, website, posters, you name it. But, did you know it is the centerpiece of a family story with just a hint of scandal? Anne Hathaway, Shakespeare's wife and widow, was born in the 550-year-old cottage that bears her name in 1556. It was built in 1463, originally as just three rooms. The first Hathaway to live there was Anne's grandfather. During Anne's childhood, the family were successful sheep farmers. After Anne's father died, her brother bought the freehold of the house. This an English property term that means the family then owned the land outright. The house was built of naturally curved timber beams, filled in with lime-washed wattle and daub - woven twigs packed with mud - and a roof of thick thatch made of reeds. It is unlikely that Shakespeare ever lived there, but he probably courted Anne while she lived in the cottage. The house was occupied by descendants of Anne's family until 1911 and some of the rare family furniture dates back to the 16th century. It's romantic to think of the beautiful, heavily-carved oak Hathaway bed as Shakespeare's marital bed, but it probably wasn't. More likely, it is the bed valued at £3 in an inventory that was part of Anne Hathaway's brother's will. Love Match or Shotgun Wedding? The marriage of Anne and Will was probably rather surprising in the West Midland's market town of Stratford-upon-Avon. Young Will's father, John Shakespeare, was a successful businessman - a glover and dealer in leather and hides - and a local politician. He served as alderman, chief magistrate and eventually Mayor of Stratford-on-Avon. His well-educated son (Shakespeare attended the King Edward VI School, a boys-only grammar school that still exists and only began admitting girls in 2013) would have been expected to marry a respectable girl in due course and probably join his father's business. Anne was a farmer's daughter from the country - Shottery, where the cottage is located, is about a mile from Stratford. She was considerably older than Shakespeare (she was 26 to his 18) and already pregnant when they married. Their first child, Susanna, was born six months after the wedding. And the marriage took place in a hurry, without posting the banns - an essential part of English custom and law - and required a special licence from the bishop. So a shotgun wedding then? Well, that's one theory. Another is that, at the time of their wedding in 1582, Anne was probably socially more well established than Shakespeare. Contrary to later stories that suggested her age made her a spinster (in our modern sense), she was the average age for brides of the time and an eligible young woman. Her father, a yeoman farmer (meaning he owned his land or held a long lease on it) had died the year before, leaving her a small inheritance that would be hers when she married. By that time, John Shakespeare had fallen on hard times, had been prosecuted for illegal trading and had withdrawn from public life. William Shakespeare could just as easily have pursued Anne, the older woman of property, as vice versa. And, as far as the pregnancy is concerned, it was not uncommon for betrothed couples to take part in an old British ceremony known as a handfasting (the expression "tying the knot" comes from this). A handfasting was a pre-marriage commitment and it was not uncommon for brides to arrive at their church wedding, a year later, already in the family way. It's a widely known story that Shakespeare ran off to make his fortune in London, leaving Anne with his family in Stratford-upon-Avon. It's unlikely, though, that he left to escape a loveless marriage he had been trapped into with an older woman. By the time he left for London, he and Anne had already had three children. And, in the end, he returned to live out his retirement with her in Stratford-upon-Avon He saw his daughter Susanna married to a prominent doctor, enjoyed the birth of his first grandchild, took part in local politics and left Anne a very rich widow. Explore the house - Guides from the Shakespeare Birthplace Trust will explain the uses and contents of the various rooms and share stories about what is known of Shakespeare's marriage and family scandals. Don't miss the remarkable Hathaway bed, described above and make note of the kitchen and parlor which are part of the original 1463 house. Visit the idyllic gardens - Imagine the perfect English cottage garden, filled with a profusion of apparently carelessly arranged flowers and shrubs and you probably have Anne Hathaway's cottage in mind. The garden is every bit as lovely as every picture postcard and calendar page you've ever seen of it. There's also a fruit orchard with heritage varieties that were probably grown in Shakespeare's time; a maze; a growing willow house made of living branches and inspired by Twelfth Night; the Shakespeare Tree and Sculpture garden filled with trees mentioned in the plays and sculpture inspired by them, and an exhibition about organic farming and the use of herbs in medicine and cooking. Retail therapy - The excellent gift shop is stocked with merchandise inspired by the house and unavailable anywhere else. Have a cream tea - Traditional English cream teas and other light meals are available in the cafe that has lovely views of the cottage. Shakespeare's Birthplace - The house and gardens of Shakespeare's father, John. It's a substantial half-timbered house in the center of Stratford-upon-Avon and exhibits rare artifacts, including a copy of Shakespeare's First Folio. There is a resident troupe of actors and, beside seeing live performances, you can join in. Mary Arden's Farm - The farmhouse where Shakespeare's mother grew up. On- site there are costumed farmworkers and guides, presenting the skills, tasks and cookery of an authentic Tudor farm, There are also heritage breeds of farm animals. Children love it. Hall's Croft - The 17th century home of Shakespeare's daughter and her husband, physician John Hall. The house offers a fascinating glimpse into Jacobean medial practices, including the herbs, gemstones and rocks that were used in healing then. It is also an example of the home of a relatively wealthy, middle class family. Shakespeare's New Place - Shakespeare's family home for the last 19 years of his life has been developed into the newest attractions. It's an Elizabethan garden and a sculpture garden as well as an exhibition center. There. you'll learn about Shakespeare's life in Stratford and the surprising story of what happened to his final house which is no longer there. The Royal Shakespeare Theatre - The theater, on the River Avon in Stratford-upon-Avon is absolutely the place to open your eyes to the most engaging Shakespearean theater you've probably ever seen along with period plays and modern theater. There's a full schedule on with something to see in at least one of the theater's three stages most of the year. There's something for all tastes, from Shakespeare aficionados to Shakespeare newbies and usually families with younger children. Directions: The cottage is about a mile west of Stratford-upon-Avon town center along local roads and country lanes. The easiest way to get there is on CitySightseeing's Hop on Hop Off bus. The bus makes frequent loops around Stratford, visiting all the Shakespeare houses and passing other sites - Shakespeare's school and the medieval almshouses. The guides are often actors working or training at the Royal Shakespeare Theatre (or hoping for a break there) so the patter is usually pretty entertaining. In 2019, an unlimited ticket for 24 hours cost £15. Hours: All the Shakespeare houses are open daily year round but hours are seasonal and a few have short, seasonal closings so, check the website for opening times to be sure.